No, there was no matrimonial interrogation in the air, just a jaded Athenian friend asking who in their right mind voluntarily sails off to the Greek islands in the middle of winter. And of course, the isle I was heading to for a short spell is a popular place for wedding celebrations – though typically when winds don’t push past 4 on the Beaufort scale and sun-god Helios has banished the wintertime Mediterranean chill. 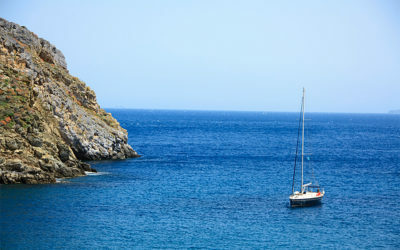 In fact my feelings about Hydra have long skewed toward the chilly: from the first time I saw photos of its only town amphitheatrically rising above the storied harbor and registered the austere façades of its sea captains’ mansions, all silvery and sober – expressionless to the point of unsmiling. Well, the line of donkeys waiting by water’s edge to take visitors where they need to go (you’re as likely to find a motorized vehicle on Hydra as at an Amish convention) softens the picture, as do some other things like the strapatsada (eggs and tomato) at Papagalos café, or a dish of homemade lemon ice cream at the port, but my heartstrings just weren’t tugged. Still, an island-goer goes. Indeed history Hydra does have and it wears it on its sleeve—it’s simply too small for anything of import to be hidden for very long. While the landscapes and quiet coves do their bit to temper any creeping heaviness, the island is very conscious of its past, and of its artistic muscle. You probably already knew that Leonard Cohen had a house here; I’m generally more drawn to places where high priests of pop and even of poetry don’t have houses. And yet: “He traveled so far for beauty,” reads one tiny plaque to Cohen I came across, right opposite a ravishing view of the indigo Myrtoan Sea. A fool could argue with that, but I wouldn’t dare. And Hydra’s heritage runs very deep. 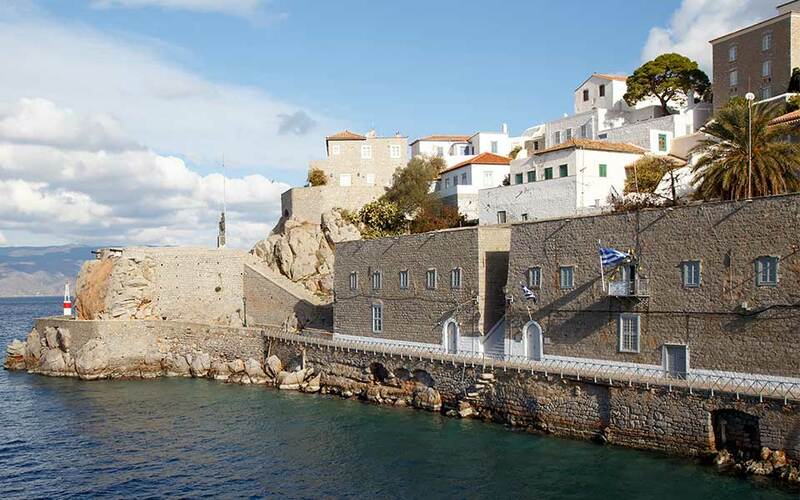 In fact there’s no better introduction to it than the Historical Archives-Museum of Hydra (IAMY), in a stern-looking grey building next to the port that is not as old as it may seem; it dates from 1996. Inside there are archives that document particularly well the more consequential goings-on of the 18th and 19th centuries here, as well as ships’ figureheads and ornamental carvings from the Greek War of Independence. The museum’s collection may completely draw you in, but it’s wise to leave some time for whatever temporary art exhibition is also on hand; a recent one featured colorful works from painter Alekos Fassianos’s French period. The duality of this institution (which by the way has a great little gift shop) speaks to the twin pillars of the Hydriot personality today: a sense of history and an embrace of contemporary cultural currents. 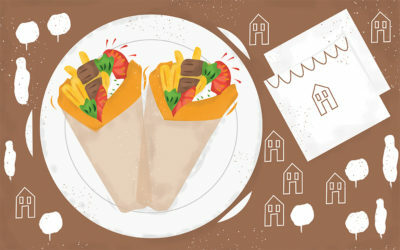 On the opposite side of the harbor, the School of Fine Arts finds its home in the tall, three-story Tombazis Mansion. Now owned by the University of Athens, the mansion belonged to Iakovos Tombazis, an admiral of the Hydriot fleet and figure in the Revolution of 1821. 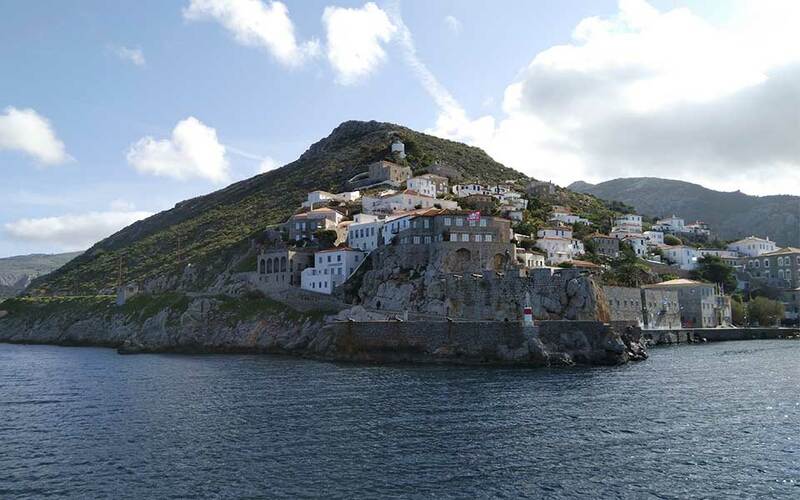 Hydra has about thirty mansions from the 18th century and about 300 former sea captain’s homes. Another notable one is the Tsamadou Mansion, close to IAMY and which now houses the Greek Maritime Academy. I didn’t see the house where legendary Hydriot naval captain Antonis Oikonomou lived, but I can’t say I didn’t feel his presence. Oikonomou prodded Hydra to join the rebellion against Ottoman rule in 1821 at a moment when that wasn’t a universally popular position to stake out, and it cost him his life. Of course Hydra ended up playing a vital role in the war thanks to its 150 ships that tussled with Turkish ones, but suffice to say that in between the tourist cafés and winding lanes of Hydra’s town, there are still a few ghosts. There’s also Jackie Kennedy (pre-Onassis), or at least a trace of her. Saunter up some of those whitewashed alleys way up beyond the bobbing boats of the port and chances are good that, as I did, you’ll stumble upon the white façade of the Rafalia Pharmacy, which has been around since 1890 and aesthetically speaking hasn’t changed much since then. The walls opposite the vintage glass-paneled wooden cabinet are plastered with simply framed black-and-white photos of famous visitors, including the former First Lady who visited Hydra on her trip to Greece in the summer of 1961. It would be later that decade that tycoons and boldfaced names like Leonard Cohen could be found at Lagoudera, the mythic night spot that, like much of what put Hydra on the map, no longer exists. 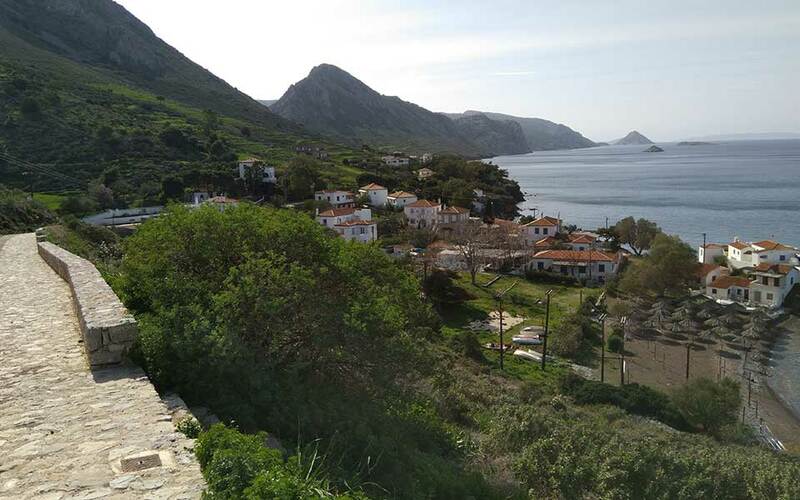 What, in my brief winter visit, I found that Hydra does still excel in is that which Mother Nature happened to endow her with: some wonderfully scenic views and the chance to experience them without the clamor of cars and motorbikes. One of the best walks is also the easiest, starting at Hydronetta Beach Bar. It may not be the season for full-moon parties and dreamy swims off the little concrete jetty below, but you can start to make mental plans for your next summer escape while continuing your stroll west on the slender stone promenade to the pretty village of Kamini. The other side of the island, plunked as it is behind the tall ridge that spans Hydra from one narrow end to the other, may as well be the dark side of the moon, especially in wintertime. But no matter: you’ll get that feeling of splendid seclusion by ambling farther along this way, in the direction of the seaside village of Vlichos. As you do, you’ll always have the shimmering sea on one side, down below, and on the other rocky hills sprinkled with cypress and olive trees, and this time of year bright pops of dewy green, too. Chances are the only other life forms you’ll encounter are wildflowers and the occasional peckish cat. And this close to Athens, that kind of silence is no minor exultation. If you want to hear more of it, again, just press upward from the port. The higher you climb, the more you seem to float above the hushed chorus line of red-tiled rooftops, and even the yachts begin to look like the toys that they pretty much are. 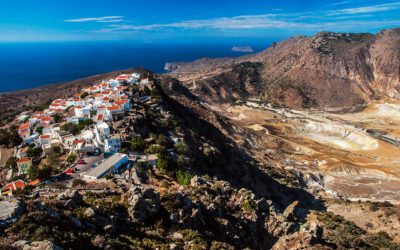 There are hiking trails in the higher reaches for the ambitious, but I’d probably hold out for warmer weather before sauntering up the slopes of Eros, Hydra’s highest peak. 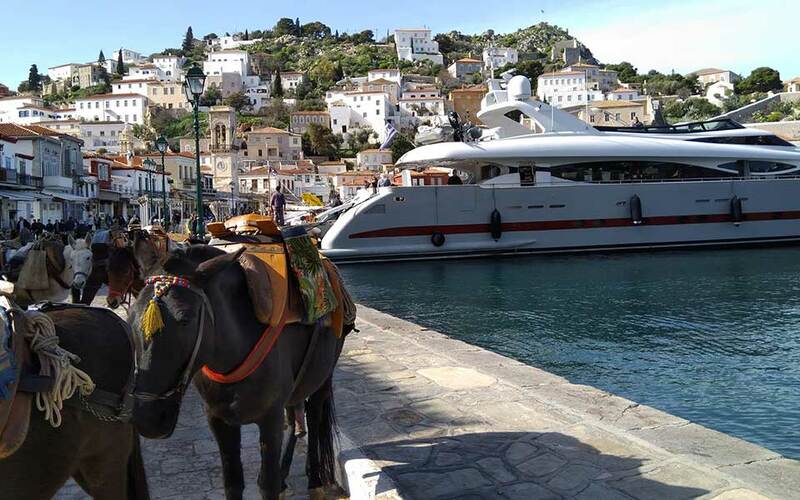 In summer you come for the sea, but know that even on midwinter days on Hydra you can often find yourself squinting under the most radiant Saronic sunshine, the air brisk and fresh. And the appeal of sinking a double espresso between a row of merrily-adorned asses and a shiny yacht or two shouldn’t be underestimated. Could I marry Hydra? Not sure! But like me you may find yourself thinking, as your Flying Cat purrs into the harbor, you know, there are worse places to have a house.